CSF and serum samples of a consecutive series of 41 FTD, 25 ALS and 46 healthy control subjects were collected from 2009 until 2014 (see online supplement 1: Methodological and statistical details, see online supplement 2: Subject characteristics). Only participants with normal CSF white cell counts (cell count <5/µL) and normal CSF amyloid-β levels (amyloid-β-42 >600 pg/mL, Innotest ELISA, Innogenetics, Belgium) were included. CSF and serum NfL concentrations were measured by a previously established electrochemiluminescence immunoassay.4 CSF levels of total tau (h-tau) were determined by a commercial ELISA (Innogenetics). NfL levels in CSF differed significantly between FTD, ALS and control subjects (F (2, 109)=88.36, p<0.001, one-way analysis of variance (ANOVA), calculated for log-transformed levels, figure 1A), also if corrected for age (F (2, 108)=88.66, p<0.001). Both patients with FTD (2557 pg/mL (median); 1760–3167, (IQR)) and patients with ALS (6658 pg/mL; (4205–10438)) showed significantly higher CSF NfL levels than controls (981 pg/mL; (777–1374)). NfL levels in ALS were significantly higher than in FTD (all p<0.001, two-sided Student's t tests, Bonferroni-corrected, effect sizes: FTD vs controls r=0.65, ALS vs controls r=0.85, ALS vs FTD r=0.59). (A) and (B) neurofilament light chain (NfL) levels in cerebrospinal fluid (CSF) and serum of frontotemporal dementia (FTD), amyotrophic lateral sclerosis (ALS) and control subjects. The boxplots illustrate the NfL levels (pg/mL) in CSF (A) and serum (B) of patients with FTD, ALS and controls. Central horizontal lines indicate median values, boxes illustrate the ranges between lower and upper quartiles, and error bars represent the full ranges of data. ***p<0.001. For data illustration on the logarithmic scale, serum NfL levels <1 pg/mL were set to 1 pg/mL. (C) Correlation of CSF and serum NfL levels in patients and controls. The scatterplot depicts the correlation between serum and CSF NfL levels within and across FTD, ALS and control subjects. For data illustration on the logarithmic scale, serum NfL levels <1 pg/mL were set to 1 pg/mL. (D) and (E) Receiver operating characteristics (ROCs) of NfL levels for FTD and ALS. The ROC curves illustrate the sensitivity and the specificity of three analytes in differentiating patients with FTD from controls (D) and patients with ALS from controls (E). ROC curves are displayed for CSF NfL, serum NfL and CSF h-tau. The area under the curve (AUC; mean and 95% CI of the mean) was used to quantify biomarker performance in FTD (CSF NfL: AUC=0.88 (0.81 to 0.96), serum NfL: AUC=0.81 (0.72 to 0.91), h-tau: AUC=0.66 (0.55 to 0.78)) and ALS (CSF NfL: AUC=0.99 (0.97 to 1.00), serum NfL: AUC=0.99 (0.98 to 1.00), h-tau: AUC=0.65 (0.52 to 0.79)). As in CSF, NfL levels differed between groups in serum as well (F (2, 69.47)=103.86, p<0.001, one-way ANOVA, calculated for log-transformed levels, figure 1B), also if corrected for age (F (2, 108)=67.01, p<0.001). Additionally, serum NfL levels were significantly increased in both FTD (47.2 pg/mL; (26.9–76.6), median and IQR) and ALS (118.0 pg/mL; (93.0–147.0)) compared with controls (17.8 pg/mL; (7.7–30.7)). 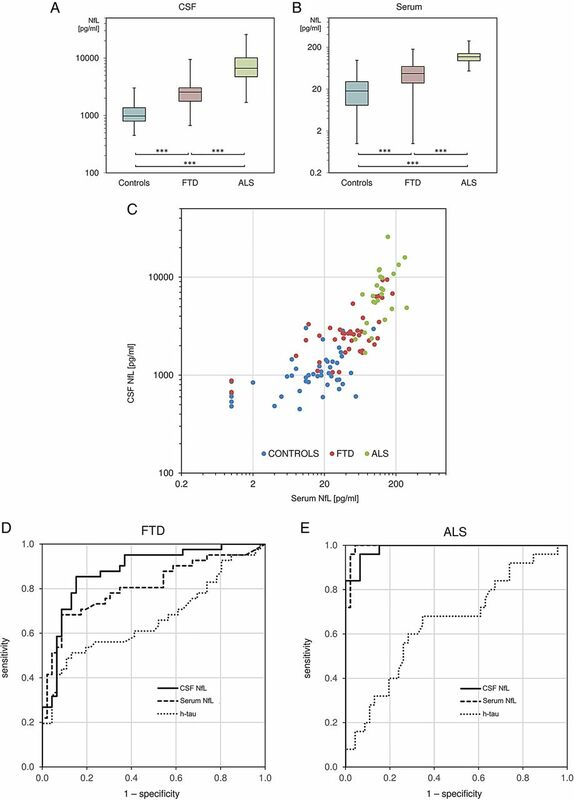 Serum NfL levels of patients with ALS were significantly higher than those of patients with FTD (all p<0.001, two-sided Student's t tests, Bonferroni-corrected, effect sizes: FTD vs controls r=0.51, ALS vs controls r=0.84, ALS vs FTD r=0.58). CSF and serum levels of NfL correlated with each other in all groups (FTD: r=+0.72, p<0.001, ALS: r=+0.58, p=0.001, controls: r=+0.53, p<0.001, one-sided Pearson correlations, calculated for log-transformed levels, figure 1C), indicating that increases of serum NfL reflect increases of CSF NfL, both in health and in diseases of the FTD–ALS spectrum. Serum NfL was increased in the FTD group as a whole, as well as within each FTD subgroup, thereby correlating with CSF NfL (see online supplement 3). Also, in patients with FTD carrying mutations in FTD genes, NfL levels were increased above the upper quartile (in 3 of 4 cases) and the median (in 1 of 4 cases) of healthy controls, respectively, indicating its potential to investigate disease processes in genetic FTD (see online supplement 4). Disease duration and severity did not correlate with NfL levels in our FTD cohort (see online supplement 5). To examine the discriminative utility of NfL for differentiating patients from controls, we calculated the receiver operating characteristic and its area under the curve (AUC). In FTD (figure 1D), both CSF NfL (AUC=0.88 (0.81 to 0.96), mean and 95% CI of the mean) and serum NfL (AUC=0.81 (0.72 to 0.91)) yielded good discriminatory performance, without significant difference between each other (p=0.243, two-sided comparison of dependent AUC values, Bonferroni-corrected), suggesting that serum NfL might perform as well as CSF NfL in differentiating patients with FTD from controls. In addition, in ALS (figure 1E), both CSF NfL (AUC=0.99 (0.97 to 1.00)) and serum NfL (AUC=0.99 (0.98 to 1.00)) achieved excellent discriminatory performance, again without significant difference between CSF and serum (p=0.999, Bonferroni-corrected), indicating that serum NfL might perform as well as CSF NfL for discriminating ALS as well. For a comparison of the discriminative utility of NfL versus h-tau levels in both FTD and ALS, refer to online supplement 6. The optimal threshold (according to Youden's procedure) for differentiating patients with FTD from controls by CSF NfL was >1561 pg/mL, yielding 85.4% sensitivity and 84.8% specificity. The respective optimal threshold for serum NfL was >36 pg/mL with 68.3% sensitivity and 91.3% specificity. These biomarker thresholds were validated by repeated 10-fold cross-validation (100 repetitions, see online supplement 1). For CSF NfL, the validation procedure indicated 82.9% sensitivity and 84.8% specificity (medians). For serum NfL, validation indicated 63.4% sensitivity and 87.0% specificity. Analogously, we determined and validated thresholds for ALS (see online supplement 2). CSF NfL has been proposed as an objective structural biomarker of neurodegeneration in FTD.1 ,2 While we confirm these previous studies, showing an increase of NfL in CSF by factor 2.5, our findings now reveal that NfL in FTD is also increased in serum by factor 2.8. Thus, serum NfL might represent an alternative to CSF NfL as a biomarker for FTD. This notion receives additional support by the significant correlation between serum and CSF NfL levels. Moreover, serum NfL was comparable to CSF NfL regarding its performance in differentiating patients with FTD from controls. These findings are of great practical relevance, as venepuncture is less invasive than CSF sampling. This aspect becomes particularly relevant if samples are to be taken repeatedly in longitudinal trials and from demented patients with behavioural disturbances such as FTD. Given the cross-sectional design of our study, conclusions about causalities and biomarker validity for disease progression cannot be arrived at. Longitudinal assessments of serum NfL are thus warranted, ideally in autopsy-confirmed cases. In our study, measures of disease duration and severity did not correlate with NfL levels. However, parameters of disease severity and progression more specific than the Clinical Dementia Rating score were unavailable (eg, scores of cerebral atrophy, cognitive function, activities of daily living). Although we used a recognised cross-validation procedure to assess the soundness of our findings, future NfL studies might also use independent patient cohorts for additional validation. CSF and serum samples were obtained from the Neuro-Biobank of the University of Tübingen, Germany (http://www.hih-tuebingen.de/core-facilities/biobank/for-researchers/). The biobank is supported by the University of Tübingen, the Hertie Institute for Clinical Brain Research (HIH) and the German Center for Neurodegenerative Diseases (DZNE). This work was supported by grants from the German Center of Neurodegenerative Diseases (DIAN intersite project). CW and OP are shared first authors. JK and MS are shared last authors. Contributors CW contributed to the design and conceptualisation of the study, analysis of the data, drafting and revision of the manuscript. OP contributed to the design and conceptualisation of the study, revision of the manuscript. CD, BR, AA, CB and LM contributed to the acquisition of data, revision of the manuscript. WM contributed to the acquisition of data, design and conceptualisation of the study, revision of the manuscript. JK contributed to the acquisition of data, analysis of the data, design and conceptualisation of the study, revision of the manuscript. MS contributed to the acquisition of data, design and conceptualisation of the study, drafting and revision of the manuscript. Competing interests WM serves on the editorial board of PLOS ONE, received funding from the European Union, Michael J Fox Foundation, Robert Bosch Foundation, Neuroalliance and Janssen, holds part of a patent for the assessment of dyskinesia (German patent office, 102015220741.2) and received speaker's honoraria from GlaxoSmithKline, Abbvie, UCB, Licher MT and Rölke Pharma, unrelated to the current project and manuscript. JK's institution (University Hospital Basel) received in the past 3 years and used exclusively for research support: consulting fees from Novartis and Protagen AG; speaker fees from the Swiss MS Society, Biogen, Novartis, Roche and Genzyme; travel expenses from Merck Serono and Novartis; and grants from ECTRIMS Research Fellowship Programme, University of Basel, Swiss MS Society, Swiss National Research Foundation, Bayer (Switzerland) AG, Genzyme and Novartis. MS received speaker's honoraria and research support from Actelion Pharmaceuticals, unrelated to the current project and manuscript. Ethics approval Ethics committee of the University of Tübingen.